If you have been following my posts for a while, you know how much I love to use materials from www.EnchantedLearning.com. 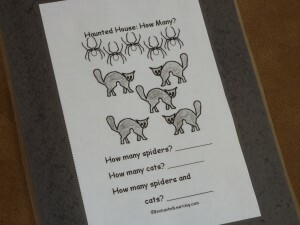 Here are some examples of what they have to help build math skills using the Halloween theme. 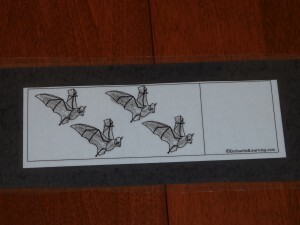 Count the bats and write the number. 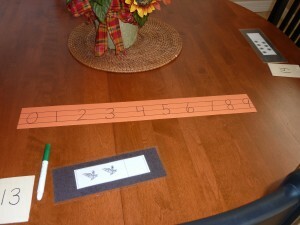 Station set up for Andrew with numbers printed so he could refer back to them. A great way to build counting skills with individual items as well as counting "how many in all?" Note: This is just me, but I wanted to make the papers look a little more appealing so I trimmed them and glued them onto black construction paper before “laminating” them with clear contact paper. I did this so I could reuse them in future My Obstacle Courses as well as share them with Andrew’s teacher to use in his classroom. 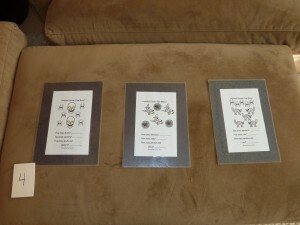 The construction paper and contact paper make them a bit more sturdy.